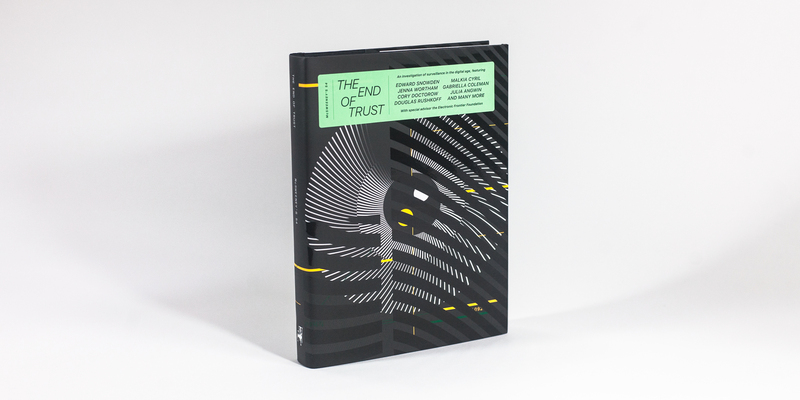 Last week the Electronic Frontier Foundation published an interesting book called The End of Trust. It was published in conjunction with the writing quarterly McSweeneys, which I have long been a subscriber and enjoy its more usual fiction short story collections. This issue is its first total non-fiction effort and it is worthy of your time. There are more than a dozen interviews and essays from major players in the security, privacy, surveillance and digital rights communities. The book tackles several basic issues: first the fact that privacy is a team sport, as Cory Doctorow opines — meaning we have to work together to ensure it. Second, there are numerous essays about the role of the state in a society that has accepted surveillance, and the equity issues surrounding these efforts. Third, what is the outcome and implications of outsourcing of digital trust. Finally, various authors explore the difference between privacy and anonymity and what this means for our future. While you might be drawn to articles from notable security pundits, such as an interview where Edward Snowden explains the basics behind blockchain and where Bruce Schneier discusses the gap between what is right and what is moral, I found myself reading other less infamous authors that had a lot to say on these topics. Scattered throughout the book are descriptions of various law enforcement tools, such as drones facial recognition systems, license plate readers and cell-phone simulators. While I knew about most of these technologies, collected together in this fashion makes them seem all the more insidious. Angwin disagrees with the title and assumed premise of the book, saying the point is more about the outsourcing of trust than its complete end. That outsourcing has led to where we prefer to trust data over human interactions. As one example, consider the website Predictim, which scans a potential babysitter or dog walker to determine if they are trustworthy and reliable using various facial recognition and AI algorithms. Back in the pre-digital era, we asked for personal references and interviewed our neighbors and colleagues for this information. Now we have the Internet to vet an applicant. When eBay was just getting started, they had to build their own trust proxy so that buyers would feel comfortable with their purchases. They came up with early reputation algorithms, which today have evolved into the Uber/Lyft star-rating for their drivers and passengers. Some of the writers in this book mention how Blockchain-based systems could become the latest incarnation for outsourcing trust. Some authors explore the concept of privacy nihilism, or disconnecting completely from one’s social networks. This was explored by Ethan Zuckerman, who wrote in his essay: “When we think about a data breach, companies tend to think about their data like a precious asset like oil, so breaches are more like oil spills or toxic waste. Even when companies work to protect our data and use it ethically, trusting a platform gives that institution control over your speech. The companies we trust most can quickly become near-monopolies whom we are then forced to trust because they have eliminated their most effective competitors. Facebook may not deserve our trust, but to respond with privacy nihilism is to exit the playing field and cede the game to those who exploit mistrust.” I agree, and while I am not happy about what Facebook has done, I am also sticking with them for the time being too. This notion of the relative morality of our digital tools is also taken up in a recent NY Times op/ed by NYU philosopher Matthew Liao entitled, Do you have a moral duty to leave Facebook? He says that the social media company has come close to crossing a “red line” but for now he is staying with them. The book has a section for practical IT-related suggestions to improve your trust and privacy footprint, many of which will be familiar to my readers (MFA, encryption, and so forth). But another article by Douglas Rushkoff goes deeper. He talks about the rise of fake news in our social media feeds and says that it doesn’t matter what side of an issue people are on for them to be infected by the fake news item. This is because the item is designed to provoke a response and replicate. A good example of this is one individual recently mentioned in this WaPost piece who has created his own fake news business out of a parody website here. Rushkoff recommends three strategies for fighting back: attacking bad memes with good ones, insulating people from dangerous memes via digital filters and the equivalent of AV software, and better education about the underlying issues. None of these are simple. This morning the news was about how LinkedIn harvested 18M emails from to target ads to recruit people to join its social network. What is chilling about this is how all of these email addresses were from non-members that it had collected, of course without their permission. You can go to the EFF link above where you can download a PDF copy or go to McSweeneys and buy the hardcover book. Definitely worth reading. Great and thought provoking summary, David. Much thanks — hope all is well!